It may be the biggest money-laundering operation in Eastern Europe – a virtual laundromat operating through banks and companies connected to powerful people in the region. “Many judges and executors may go to prison” said Vasile Șarco, the head of the Money Laundering Prevention Unit in Moldova, which has been looking into the case since December. The Organized Crime and Corruption Reporting Project (OCCRP) has worked through the system’s intricacies to uncover the methods and the partners who ran The Laundromat. The banks and companies involved are run by managers and board members that include well known businessmen, a cousin of Russian President Vladimir Putin, and persons said to be close to the KGB. The key to the system was the involvement of Moldova, a country caught between its aspirations to join the European Union and its history of close ties to Russia. The scheme used Moldova to both provide legal protection against regulators through the country’s judicial system and a means to inject the illegal money into the European Union’s financial systems. The eternal problem with dirty money is explaining where it comes from. Crime is mostly a cash economy, and mobsters or dirty government officials can end up with massive piles of cash they don’t want to explain to anybody—especially tax officials. The Laundromat was designed to create the illusion of business activity to explain the source of the money, backed by a court which signed off on the transactions to make them legitimate. The businesses, however, were phantom companies shielding the real owners. A typical transaction began with two companies, often based in the United Kingdom and with their true ownership obscured in the offshore mists of a tax haven. The companies sign a bogus contract in which one agrees to lend the other large sums, although no money ever actually changes hands. It is likely that both companies are owned by the same owner but that ownership is hidden behind “proxy” figures. The tax haven of choice in this operation was Belize, and the sums involved in each transaction were huge, ranging from US$ 100-800 million. The contracts in each case stipulated that the debt was guaranteed by companies in the Russian Federation, almost always run by a Moldovan citizen. This Moldovan gave the operation access to the courts in Moldova, which would ultimately permit the movement of the dirty money into the legitimate banking system. The next step was for the “borrowing” company to refuse to repay the debt to the “loaning” company, thereby shifting the debt to the Russian companies who had guaranteed the loan. The “loaning” company then would take the matter to court in Moldova where a judge would issue an order “certifying” the debt as real and ordering the Russian company to pay. Then the Russian company would transfer dirty money into an account set up by the “loaning” company. For every case, the money was sent to an intermediary bank called Moldindconbank—an institution connected to one of the country’s most powerful businessmen. Finally the money was wired to the “loaning” company’s account, which was always at the Latvian-based Trasta Komercbanka. And once it is in Latvia, voila! It is in the European Union, backed by a court order and clean and ready to use. The OCCRP investigation found that 19 Russian banks, some already being investigated for money laundering, used The Laundromat. More than 20 judges in 15 Moldovan courts helped launder the money. Over three years, they issued more than 50 court orders certifying about US$ 20 billion in debt. This is a staggering amount for a country such as Moldova that had a GDP of just under US$ 8.5 billion in 2013. Some of these judges are now under investigation while others have resigned. The Laundromat opened for business on Oct. 22, 2010, when a British company called Valemont Properties Limited filed suit in a court in the Moldovan capital of Chișinău against the guarantors of a loan it had made to another UK company. The holders of that guarantee were a Moldovan man, Andrei Abramov, and two Russian companies: OOO LaitaM and OOO Spartak. OCCRP found Abramov at his workplace, the Chișinău Airport. He said that he got involved with the Russian companies in 2010, right after he completed his civil aviation studies and was looking for a job. Abramov said the man told him he had a consultancy firm and wanted to open a branch in Moldova with Abramov as the manager. Abramov said he was directed to go to Chișinău’s main bus station, where he received packages of documents from Ukraine. Then he would send them onward to Russia. He said he was disappointed that the promises made about his new job were not kept. “I signed a document once for a court in Rîșcani where I said that I don’t have any objection regarding an ongoing trial,” he said. OCCRP found out from border police documents that Abramov visited Ukraine four months before the Valemont Properties court case. Other Moldovan citizens used in Laundromat operations frequently travelled on the Chișinău-Moscow route. The court case involving Abramov was tried by a Moldovan judge, Gheorghe Gorun, who certified the debt and ordered the Russian companies and Abramov to pay up. Gorun’s decision was enforced by a Moldovan judicial executor, Anatolie Chihai, who acted as a go-between. Chihai opened an account with Moldindconbank to receive money transferred from Abramov’s Russian company, which was then transferred again into the Trasta Komercbanka account of Valemont Properties in Latvia. This money route–Russian banks to Moldinconbank to Latvian Trasta Komercbanka–was to be used in all of The Laundromat’s money transfers. Trasta officials refused to comment on the cases. OCCRP obtained banking statements that show multiple money transfers into Chihai’s bank account. Both Russian companies, OOO LaitaM and OOO Spartak, transferred billions of rubles that were exchanged for British pounds and sent onwards to Valemont. The money came to Moldova from accounts in two Russian banks, EB Transinvestbank OOO and KB Inkredbank. Valemont Properties is involved in other Moldovan court cases aimed at recovering debts. In each case, the British company was represented by Ukrainian Bogdan Kuchay, 32. He is a director of OOO Prime, a Russian company founded in 2012, which lists as sole shareholder a Belize offshore company called Denison Limited. Denison has sued debtors in the same manner as Valemont. Kuchay is involved in other controversial court cases as well. The Superior Council of Magistrates (SCM) concluded in a May 27 statement that many rulings in debt recovery cases were issued illegally. The SCM says that the judges based their judgments solely on documents that had not been properly authenticated or notarized, a practice contrary to normal court procedures. Ukrainian Bogdan Kuchay became a main actor in another judicial case in Moldova in 2013 after he and fellow Ukrainian Roman Rybchenko, 22, acquired seven shares or 0.00014 percent of the share capital of the Moldovan insurance company, Compania Internațională de Asigurări S.A “ASITO”. Investigators say they acquired these shares for the sole purpose of suing the company and blocking its bank accounts so that ASITO could not pay pensions to more than 8,000 Moldovan retirees. A Chișinău judge, Svetlana Garstea-Bria, accepted Kuchay’s suit as valid and pensioners stopped getting money. The case is still on trial while the Moldovan National Commission for Financial Oversight asked the Superior Council of Magistrates, the governing body over Moldovan courts, to sanction the judge who accepted the case. OCCRP reporters met with Valeriu Gîscă, one of the judges who issued five judgments for The Laundromat, in a parking lot next to the Moldovan Government building. He came to the meeting in a black SUV, wearing casual clothes. His rulings certified no less than US$ 2.1 billion that left Russia for offshore company accounts before he resigned in 2012. 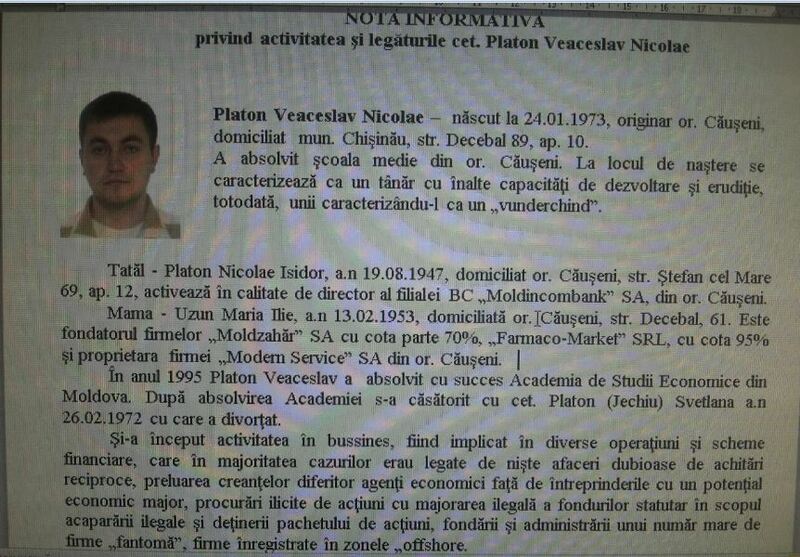 According to SCM, Gîscă put in his resignation request on grounds of ill health on Nov. 22, 2012. On Dec. 18, Gîscă issued one final Laundromat judgment for half a billion US dollars, and three days later he was relieved of his duties. Now a lawyer, Gîscă says his rulings followed the law and did not hurt the Moldovan financial system or any bank and just affected one citizen. “Each time, a guy from Chișinău presented me with paperwork showing that the parties involved had no objections in the court case. These documents were authenticated at the highest possible levels,” he said adding none of his rulings have been overturned. “If someone laundered money and used us, it is up to the Moldovan law enforcement to prove it. I don’t know who could possibly be behind it and I had no idea that other judges issued the same kind of rulings in Moldova,” Gîscă said. Șarco said his office started a case against an executor in February of this year and in March arrested another executor. On July 22, Moldovan Prime Minister Iurie Leancă proposed a set of laws that, if Parliament passes them, would end impunity for judges implicated in money laundering. Moldovan law enforcement believes that more than 90 companies registered in the Russian Federation were involved in The Laundromat system, making thousands of transfers into bank accounts in Moldova and, from there, onward to offshore companies’ bank accounts. OCCRP investigated the ownership of some of these companies. It found a number of cases in which directors and shareholders were citizens of Moldova and Ukraine. They appear to be proxies, fronting for the real people behind the money schemes. One example was OOO Proffstandart, a Russian company, listed with four other commercial entities in Moldovan courts with a debt of half a billion US dollars to the Scottish company, Westburn Enterprises Limited. The majority shareholder of OOO Proffstandart is Ruslan Siloci, 31, from Căușeni, a small town 70 kilometers from the Moldovan capital and 40 kilometers from Tiraspol, the main city in the separatist region of Transdniestr. Căușeni is the hometown of a powerful businessman, Veaceslav Platon, whose father, Nicolae, is head of the local Moldindconbank, the main Moldovan bank engaged in The Laundromat’s money transfers. Siloci lives in the outskirts of the city in his grandparents’ home. When OCCRP reporters visited on June 19, the door was locked. Just then the women pointed out Siloci in a blue Mercedes. Siloci said Proffstandart has been closed. OCCRP asked Siloci why his company got entangled in debt. He said he was approached by “clients” who offered him a money making deal. Evgheni Vîborov is another Moldovan citizen involved in the Westburn scheme. The 33-year-old driver for an express delivery service in Chișinău is listed as a shareholder and director of the Russian firm OOO Komtehkomplekt. He denied doing anything wrong and was worried to hear about his involvement in a suit over The Laundromat. “I was in Moscow in 2009 when someone I knew there advised me to buy a company,” Vîborov said. “I was taking care of computers and other technical equipment. In about 2012 I shut down the company and came back to Chișinău. I believe I have given power of attorney to someone but it was long ago and I don’t remember. “Nobody gave me money and nobody looked for me,” Vîborov said. “I wouldn’t have had to mortgage my house, I’d have my own car and I wouldn’t be working as a driver if I had received money. It never crossed my mind that my company is involved in such a court case,” said Vîborov. Moldovan Parliament member, Nae-Simion Teodor Pleșca, bought Vîborov’s neighboring apartment for US$ 53,500 to expand his own apartment. Vîborov still uses it as his official address.